B' e Prìomhaire na Rìoghachd Aonaichte bho 1905 gu 1908 a bh' ann an Eanraig Caimbeul MacGille-na-Brataich (Beurla: Henry Campbell-Bannerman), GCB (7 an t-Sultain 1836 – 22 an Giblean 1908). Rugadh e ann an Glaschu, Alba. Dh'ionnsaich e clasaigeachd aig Oilthigh Ghlaschu agus Oilthigh Chambridge. Bha e na BhP airson Borgh Sruighlea eadar 1868 agus 1908. Chuir e Bile an Fhearainn air beulaibh na Pàrlamaid. 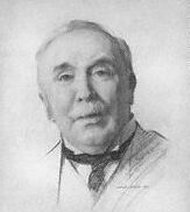 ↑ “Sir Henry Campbell-Bannerman”. Hansard. Air a thogail 24mh dhen t-Samhain 2016. Air a tharraing à "https://gd.wikipedia.org/w/index.php?title=Eanraig_Caimbeul-MacGille-na-Brataich&oldid=535641"
Chaidh an duilleag seo a dheasachadh 6 dhen Lùnastal 2017 aig 07:23 turas mu dheireadh.